Honda TRX250Rs don’t have fans. They attract devotees—riders and owners with a two-stroke obsession that infests every cell with a sneaky efficiency that would make a papa virus proud. 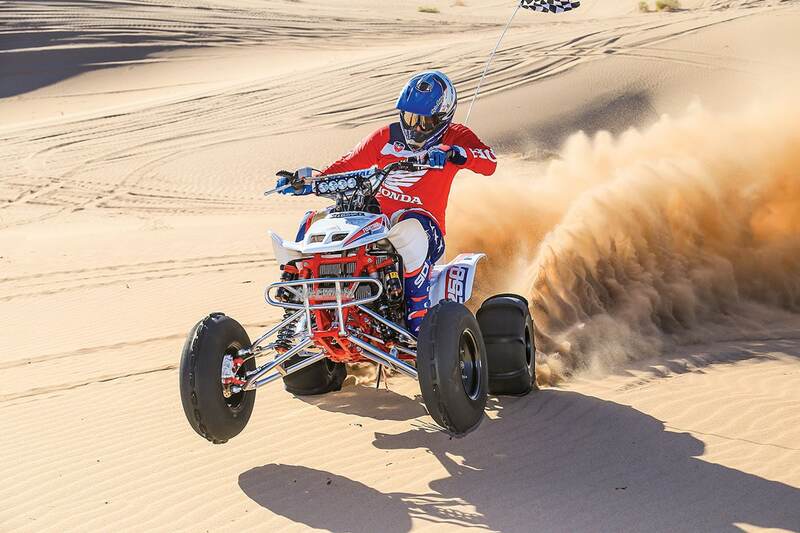 Like many TRX250R obsessions, Eric Christiansen’s started out many years ago. When he bought this machine 20 years ago, it was a wedding gift for his wife. Yes, we have all heard the “it’s for my wife” line before, but she actually spent a lot of time riding it for the first six years they owned it. After those six years his wife took a break from desert riding. At about the same time, Eric had experienced enough motocross and motorcycle injuries that he started to play with the TRX250R. The obsession soon took hold. By the time his wife was interested in the desert again, the TRX was too fast for her. She rides a TRX450R now. Meanwhile, Eric was partially managing to keep the TRX addiction somewhat in check. 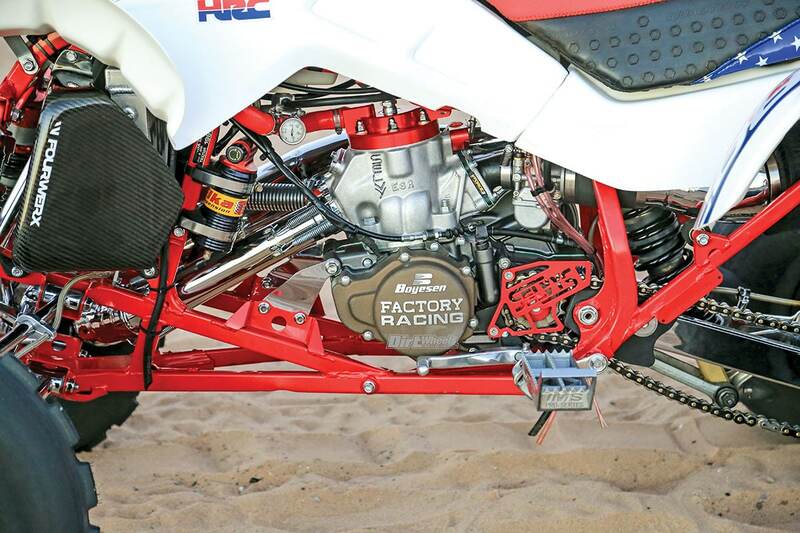 While the red frame is a showpiece, it is a stock Honda TRX part. So far he has been able to resist an aftermarket frame. He has a LoneStar Racing stock-length swingarm, Axcalibar axle and stem, but he hasn’t caved in to the whispery voices telling him to go to wide and long travel. He couldn’t resist the promptings telling him that Elka’s Stage 3 combo deal of $999 for all three shocks is too good to pass up. Vintage Burgaurd A-arms on the front have been on the quad for years. It isn’t that this TRX363R doesn’t turn well. It does, but it simply accelerates so hard that it just straightens up and leaves at speed. You’ve heard of no-fly zones for airplanes? The TRX250R engine isn’t exactly a mental and pocketbook no-control zone, but Eric has enough faith in Rob Selvy to let him have a pretty free hand with this monster of an engine. It was a 310cc engine when it was too much for Mrs. Christiansen, and now it is a 363cc monster stroker with 68 horsepower! All of Selvy’s engines are custom builds for the customer, but the basic engine price is $1500 plus parts. In this case the parts are quite a list: 4mm stroker crank, a spacer plate, a billet head, ESR cylinder, Moto Tassinari reed cage, Mikuni carburetor, Selvy pipe and silencer, CV4 silicone radiator hoses and Honda CBR street bike radiator. Also included are a Hinson clutch and clutch cover, a Boyeson Factory Racing cast-ignition cover and an in-line cooler in one of the radiator hoses. There isn’t much of the original Honda TRX250R in there—at least not in unmodified form. Still, it is ultra fast and civilized for a 30-year-old machine. What you can’t see from the outside is some major porting, including some undisclosed ports added to the cases. The CBR street bike radiator is used for added cooling. Even though Christiansen and Selvy have taken pains with the cooling, a temp gauge is inserted in one of the coolant lines, so the rider can keep constant track of engine heat. With an engine featuring almost a 50-percent increase in displacement and well over a 100-percent increase in power, some added cooling is in order, as is the vigilant care monitoring the temperature. LoneStar Racing makes a pretty swingarm and a strong rear axle. The rear of this machine is clearly the business end. 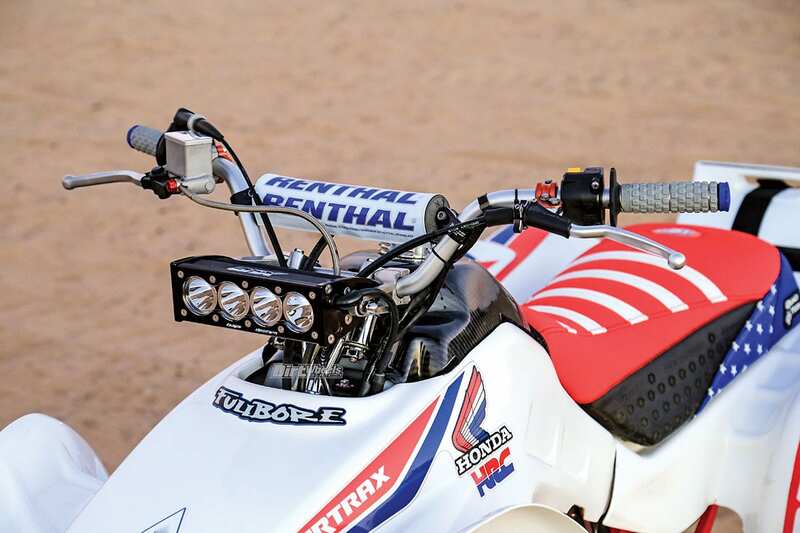 A Renthal handlebar is mounted on the LoneStar anti-vibration steering stem. This steering stem put the handlebars at the perfect height. No need for a death grip. 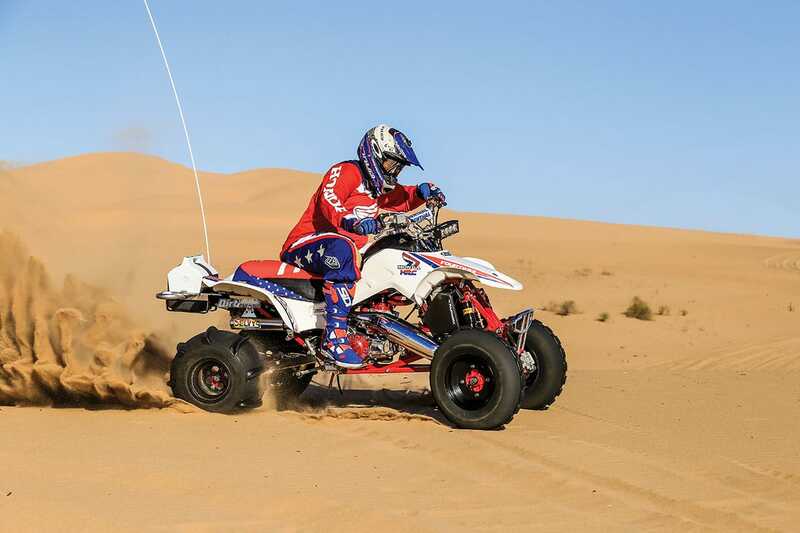 This quad is fitted with an adjustable, stick-type Streamline steering damper. Some TRX250R owners are switching to TRX450R brakes, but Eric bead-blasted and fully rebuilt the brake system, but it is stock TRX250R. It uses a Honda clutch perch with a folding lever and a twist throttle from a Honda CRF motocross model. 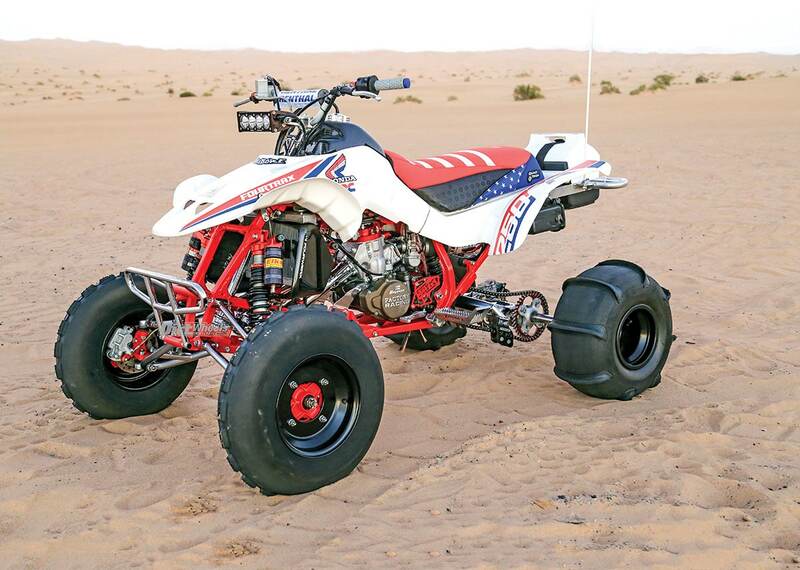 The Quad Tech seat cover has a tall, desert-style foam under it, and toothy IMS Roll footpegs keep your feet planted. A machine this powerful is thirsty, so an IMS 4.0-gallon tank does the job. A FourWerx carbon tank cover boosts the style points. Eric’s baby sees little to no use away from the dunes, so it isn’t running any protection for the undercarriage. Clean stock plastic is rare and expensive, so the plastic on this machine is from Fullbore Innovations. A popular performance mod is to add a CR250R motorcycle ignition from the early 2000s, but that eliminates the ability to run lights. Eric chose to stay with the stock ignition so he can run a powerful Baja Designs light bar mounted like a normal headlight. The cockpit is well-suited to an ex-motocross motorcycle racer. With the Baja Designs lights, there is no reason to let night stop the fun. 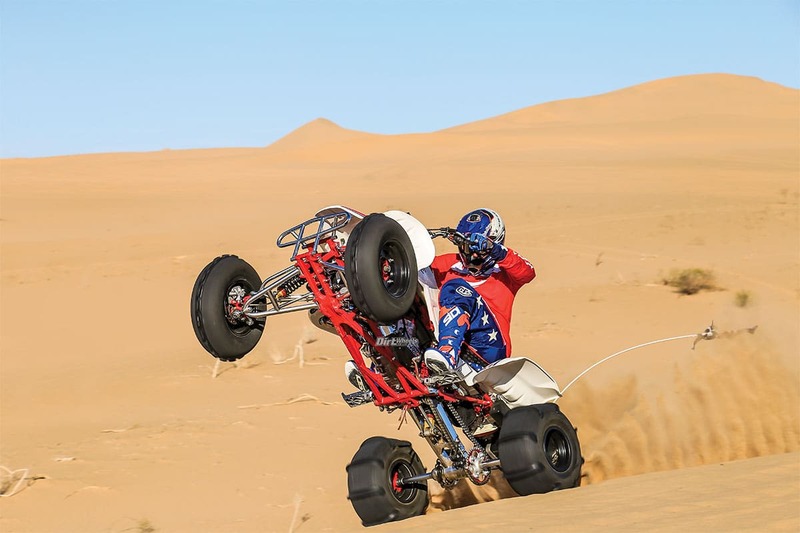 There is only one reason to have an engine this powerful in a TRX: charging big dunes and railing giant bowls. 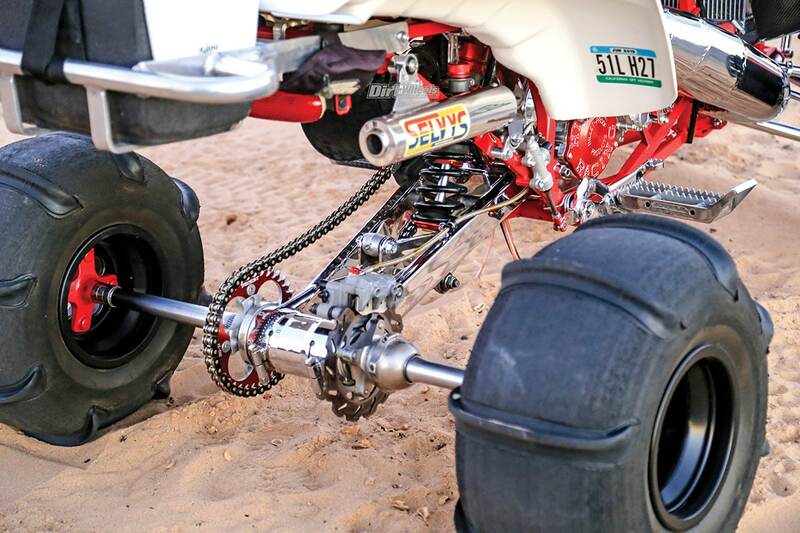 For such an all-inclusive engine mod, the Selvy 363cc stroker is remarkably easy to kick-start. You can’t be timid, but it lights right off and runs clean with a crisp bark to the throttle. We have ridden some big-bore engines that shake like paint mixers, but this one is very smooth-running with little vibration. Slipping it into gear gives you appreciation for the Hinson parts. The clutch has a clean engagement, and it drops smoothly into gear with no clunks or jerks. Remember, this is an engine design that is over 30 years old! It helps that Honda did a good job on the original, but this is still impressive. 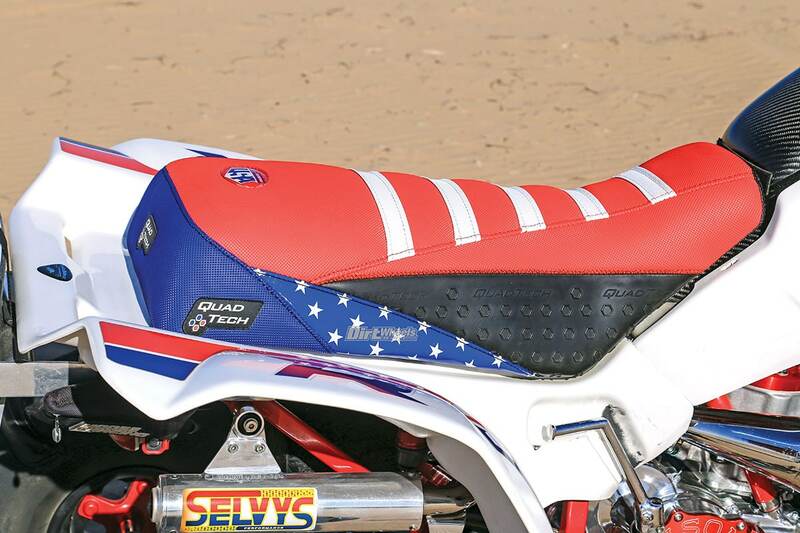 We are fans of this well-padded seat and the Quad Tech seat cover. It has appropriate traction where needed. These are tough covers. Rolling away from a stop is easy enough in the sand. You can roll on the power. It pulls well at low rpm, but you can feel that there is energy waiting for the rpm to find the happy place. The transition came in smooth, but we can see why Eric’s wife went looking for a 450 four-stroke. It hits as hard as an open-class two-stroke with massive acceleration. It throws you back on the seat and insists that you keep a firm hold on the bar. The engine is geared higher than stock to keep you from tap-dancing with the shifter. As a result there is a good, long pull in each gear. The top speed is daunting. As Eric was hitting corners for photos, the TRX363R would initiate the turn just fine, but when the engine hit the sweet spot, the front wheels lifted and sand began sluicing off the rear tires. The TRX tended to simply rocket off in the direction the rear wheels were aimed rather than drifting the rear around the turn. Meanwhile, the engine is heading for redline, and your adrenal glands are running about equal to the engine. The acceleration is so visceral and muscular, it is a sublime experience. Nevertheless, it is an engine best reserved for experienced riders. Since every Selvy engine is unique, you can have whatever you want. Eric Christiansen has a long history with this machine, and despite the prodigious power, he controls it easily to perform long wheelies. After riding this machine, we can see why Eric Christiansen has found room for it in the garage for 20 years. We also see why he was motivated to undergo the most recent redux of this amazing machine. It is a beauty but no trailer queen. You can easily see that when he rides it. And looking at the machine gives you some clue of the pride he has in the machine—the mighty 250R!